In this post i will show the different ways of binding WPF control elements with the different sources. 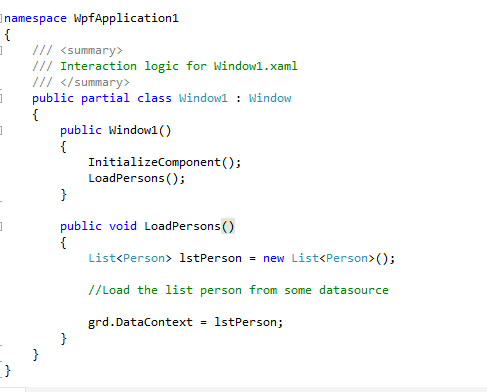 WPF provides binding both declarative and imperatively through code. It provides greater flexibility to the developer to bind the target value to source value in the XAML file. The term data binding describes the process of creating a dependence for the value of one property i.e. the target property to the source property. The target property takes on the value of the source property. In some cases, changes to the source property are transmitted to the target immediately, but in some cases, they are not. Following are the types of bindings that are the part of this post and mostly used in WPF applications. 1. Binding target value to WPF element. 3. Binding to Ancestor properties through RelativeSource property. This type of binding used when you want to bind the target property to any WPF element (control) property. For e.g. you want to bind the Textbox text to the label Content property. When the user write in the textbox it should reflect the change in the label control. 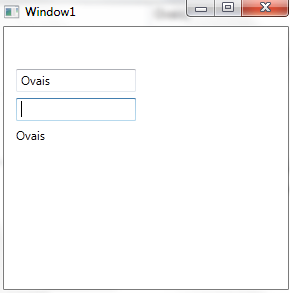 In this case, you add a textbox and a label controls in the WPF form. And specify the binding as follows. Above code snippet shows the binding of Label Content target property with the Textbox Text source property. Now when you run the application and write something on textbox it will directly reflect the changes on the Label. When binding to an Object we use Source property to specify the source object. For binding with object, in the Window.Resources tag user has to specify the Resource object. Below code snippet shows the way of binding an Object property with the resource object. The above code snippet binds the StaticResource to the personObj which was defined in the Window.Resources tag and Path specified the property which holds the value. Now when run the application it will bind the TextBlock text value with the property value. When the form loads it initialize an object and fill the value obtained from that object property. If you want to pull data from some other datasource at runtime then you don’t need to specify the Binding Source property and only have to specify the Path property and in the code behind bind the TextBlock text source to that object value. You can also specify the StaticResource binding property over Grid level or at container level. So you don’t need to specify the static resource property on every control bindings. All the controls that come under that container will use that datasource. But you need to specify the path which maps the property to that object property. Following snippet shows the way of binding through DataContext property at Container level. Using the RelativeSource attribute in the binding you can bind the source to the ancestor property value. For example you have specified the Tag attribute in the Grid container. And you want to bind the Tag property in the Textbox control that comes under grid container. You can do that by using RelativeSource property. Following code snippet shows the way of binding to ancestor properites through RelativeSource property. This is when you want to bind the Collection controls like Listbox etc. with different datasources.ListBox in WPF contains an ItemSource property which helps to bind the datasource. Normally in business application collection retrieves from database. So you dont need to specify the Source property in the Listbox ItemsSource property and just specify the Binding keyword followed with the DisplayMemberPath which is used to map the object property retrieved from the Collection to the control display item property. Following code snippet shows the binding. Using ObjectDataProvider class you can bind a WPF element to a method called on an object. You can specify an object type and a method on that type. WPF also provides an option to bind methods that have parameters in its signature and user can define the method parameters declaratively in XAML with their default values. Below code snippet shows the way of binding method that contains no parameters in its signature. In the code above first i created a method named GetText which return some string. And then I have specified the ObjectDataProvider tag and reference it in the TextBlock. Below code snippet shows the way of binding method that contains two parameters in its signature. Specify ObjectDataProvider in the XAML. When run the Application and enter the data in two textboxes, the Concat method takes the values from those textboxes and bind the returned concatenated string with the TextBlock as shown below. Hi, Neat post. There’s an issue together with your website in web explorer, would test thisÖ IE nonetheless is the market leader and a huge part of folks will miss your magnificent writing due to this problem. I was examining some of your blog posts on this website and I conceive this site is really instructive! Keep on putting up. Nice read, I just passed this onto a colleague who was doing some research on that. And he actually bought me lunch since I found it for him smile So let me rephrase that: Thank you for lunch! “By nature, men are nearly alike by practice, they get to be wide apart.” by Confucius. Greetings I am so grateful I found your weblog, I really found you by mistake, while I was browsing on Digg for something else, Regardless I am here now and would just like to say thanks for a remarkable post and a all round thrilling blog (I also love the theme/design), I donít have time to read through it all at the minute but I have saved it and also added in your RSS feeds, so when I have time I will be back to read much more, Please do keep up the awesome job. Many thanks for being my personal mentor on this issue. My partner and i enjoyed your own article greatly and most of all enjoyed how you handled the areas I regarded as being controversial. You’re always rather kind towards readers much like me and aid me in my living. Thank you. I do accept as true with all the ideas you have offered to your post. They are very convincing and will definitely work. Nonetheless, the posts are very brief for newbies. May just you please extend them a little from subsequent time? Thanks for the post. Keep up the fantastic work , I read few blog posts on this internet site and I conceive that your web blog is real interesting and has bands of fantastic information. hi!,I really like your writing very much! percentage we be in contact more about your post on AOL? I need an expert on this space to solve my problem. Maybe that’s you! Looking forward to peer you. Appreciating the dedication you put into your web site and in depth details you present. It’s nice to come across your site every once in a while that isn’t the same outdated re-written information. Great study! I’ve bookmarked your internet site and I’m including your RSS feeds to my Google account. Keep up the excellent work , I read few content on this site and I think that your website is rattling interesting and holds bands of fantastic info . Outstanding post, I think people should acquire a lot from this web site its really user pleasant. “Frisbeetarianism is the belief that when you die, your soul goes up on the roof and gets stuck.” by George Carlin. I’d must test with you here. Which isn’t one thing I usually do! I enjoy reading a submit that can make people think. Additionally, thanks for allowing me to comment! I was examining some of your blog posts on this site and I believe this web site is very instructive! Continue putting up. I would like to thnkx for the efforts you have put in writing this web site. I am hoping the same high-grade blog post from you in the upcoming as well. Actually your creative writing skills has encouraged me to get my own website now. Actually the blogging is spreading its wings quickly. Your write up is a great example of it. Do you have a spam problem on this blog; I also am a blogger, and I was wondering your situation; many of us have created some nice methods and we are looking to exchange methods with other folks, why not shoot me an e-mail if interested. Sweet site, super style and design, very clean and utilise friendly. Rattling nice layout and excellent content, hardly anything else we require :D.
You are my inhalation, I possess few web logs and occasionally run out from post :). “The soul that is within me no man can degrade.” by Frederick Douglas. I like this blog its a master peace ! Glad I observed this on google. “Don’t spend time beating on a wall, hoping to transform it into a door.” by Dr. Laura Schlessinger. wonderful submit, very informative. I ponder why the opposite experts of this sector don’t notice this. You must continue your writing. I’m sure, you have a great readers’ base already! Thank you a lot for sharing this with all of us you really recognize what you are speaking approximately! Bookmarked. Kindly also consult with my website =). We can have a hyperlink alternate agreement among us! Keep up the wonderful piece of work, I read few posts on this web site and I think that your blog is rattling interesting and has got lots of wonderful info . Kudos for this article. Highly interesting and excellently penned article. Thanks! I really enjoy examining on this web site, it has superb articles. “A short saying oft contains much wisdom.” by Sophocles. Deference to post author, some excellent information . “If you don’t leap, you’ll never know what it’s like to fly.” by Guy Finley. What i do not understood is in reality how you are now not actually a lot more well-liked than you might be right now. You’re so intelligent. You recognize therefore significantly in the case of this subject, made me in my opinion imagine it from so many various angles. Its like women and men aren’t interested except it’s one thing to accomplish with Lady gaga! Your individual stuffs outstanding. All the time care for it up! The next time I read a weblog, I hope that it doesnt disappoint me as a lot as this one. I imply, I know it was my option to learn, however I really thought youd have something fascinating to say. All I hear is a bunch of whining about something that you could possibly repair if you happen to werent too busy searching for attention. I am not very good with English but I find this real easy to interpret. I was reading through some of your posts on this internet site and I believe this site is rattling instructive! Keep posting. I am not rattling great with English but I get hold this very easy to understand. Hello there, You’ve performed an incredible job. I’ll definitely digg it and in my view recommend to my friends. I’m sure they will be benefited from this website. I really enjoy reading on this site, it has got great content . “Those who complain most are most to be complained of.” by Matthew Henry. Thank you, I have recently been searching for information approximately this topic for a long time and yours is the best I’ve found out till now. However, what about the conclusion? Are you certain about the source? Howdy! I know this is kinda off topic nevertheless I’d figured I’d ask. Would you be interested in trading links or maybe guest authoring a blog post or vice-versa? My site discusses a lot of the same topics as yours and I think we could greatly benefit from each other. If you happen to be interested feel free to send me an e-mail. I look forward to hearing from you! Wonderful blog by the way! 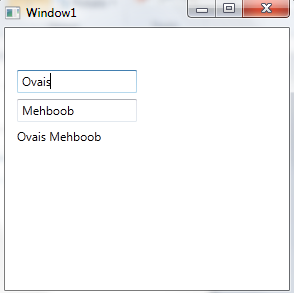 I think this WPF Data Binding Options Ovais Mehboob's TechBlog website holds some real superb information for everyone. “It is easy enough to define what the Commonwealth is not. Indeed this is quite a popular pastime.” by Elizabeth II. Great post, I conceive blog owners should acquire a lot from this website its really user pleasant. So much fantastic info on here :D.
I would also like to add if you do not now have an insurance policy or maybe you do not take part in any group insurance, you could possibly well gain from seeking assistance from a health insurance agent. Self-employed or people with medical conditions normally seek the help of one health insurance agent. Thanks for your text. My partner and I absolutely love your blog and find most of your post’s to be exactly I’m looking for. can you offer guest writers to write content for you? I wouldn’t mind creating a post or elaborating on a lot of the subjects you write concerning here. Again, awesome blog! This internet website could be a walk-through its the data you wanted in regards to this and didn’t know who need to. Glimpse here, and you will completely discover it. I’m honored to obtain a call from my friend as he found out the important suggestions shared on your site. Examining your blog posting is a real brilliant experience. Thanks again for thinking of readers like me, and I desire for you the best of success as a professional surface area. I believe this web site has very superb composed subject matter articles. I like this web site very much, Its a rattling nice berth to read and incur info. “Intimacy is what makes a marriage, not a ceremony, not a piece of paper from the state.” by Kathleen Norris. Actually great submit, Thank you for sharing This knowledge.Excellently drafted article, if only all bloggers offered similar level of content while you, the internet would be a very much better place. Please retain it up! Some truly nice and useful information on this web site, as well I believe the pattern holds fantastic features. Thank you for your complete valuable efforts on this blog. My mother takes pleasure in under-going investigations plus its simple to grasp why. The majority of us hear all with regards to the powerful means you convey insightful information as a result of the internet site and as well improve contribution from guests on that content plus my simple princess is undoubtedly learning a great deal. Take pleasure in the remaining area of the new year. You’re doing a very good job. An interesting post there mate ! Thank you for that . Good site you have here.. It’s difficult to find quality writing like yours these days. I seriously appreciate individuals like you! Take care! !